A practicing psychoanalyst and organizational consultant, Ken Eisold plays a leading role in exploring the extensive and multifaceted unconscious dimensions of our lives. His work uncovers how the knowledge and ideas we don’t know we know, the beliefs and assumptions we don’t know we have, decisively shape our thinking and behavior in organizations, politics, government, as well as in our personal relationships. Dr. Eisold is Past-President of the International Society for the Psychoanalytic Study of Organizations. He is also a former Director of the Organizational Program at the William Alanson White Institute, which he helped to found. For several years he directed the A. K. Rice Institute’s National Conference on Leadership and Authority. A member of the Boswell Group, he has published in the Harvard Business Review and provided commentary for The Wall Street Journal. 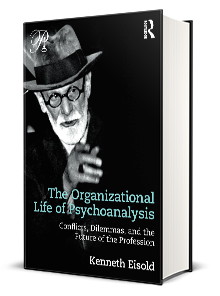 His most recent book, The Organizational Life of Psychoanalysis, brings together his work on the conflicts, dilemmas and difficulties that have beset the institutes, societies and associations of the profession throughout its history, and it illuminates the profound challenges it is currently facing. His book, What You Don’t Know You Know: Our Hidden Motives in Life, Business, and Everything Else, was published by Other Press. His many papers and publications have focused on such topics as leadership, war, corruption in organizations, the relevance of dreams to work, as well as the dilemmas and unconscious dynamics of psychoanalytic institutions. They have been published in such journals as the International Journal of Psycho-Analysis, The Journal of the American Psychoanalytic Association, The Journal of Psychosocial Studies, Human Relations, Psychoanalytic Psychology, and Contemporary Psychoanalysis. Many have been translated and published in European journals.